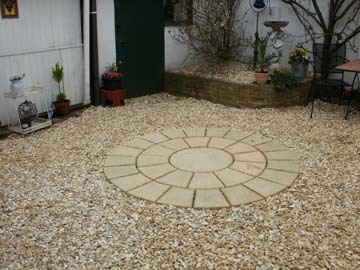 Paving slabs are available in a vast range of styles, patterns and textures. From natural stone paving to more modern engineered slabs. MJS can source all types of paving slabs at trade prices. The price of paving has change over the last few years, Natural imported stone has become cheaper whilst the cost of many of the man made paving slabs has risen. There is now very little difference in cost between a quality indian sandstone and the pressed concrete equivalent. The main difference netween man made slabs and natural stone slabs is the thickness. Man made slbs are generally all the same thickness and therefore faster to lay. The bedding layer can be made for multiple slabs prior to laying making the instllation slightly cheaper. Man made slabs lso have a more uniform texture and less variation in the surface of the slab.